Learn how Oracle Social CRM applications leverage Web 2.0 technologies to help salespeople identify qualified leads, develop effective sales campaigns and presentations, and collaborate with colleagues to close more deals quickly. The challenging economy is forcing salespeople to do more - to spend more time on the road, to uncover more opportunities, and to follow-up on more prospects. This is forcing salespeople to be more resourceful and creative in how they generate leads, pique the interest of prospects, and close deals. Yet, recent research suggests that salespeople spend much more time on administrative duties than on direct selling activities. 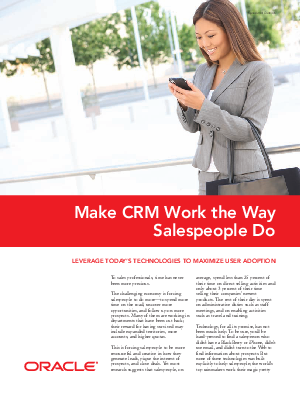 This white paper examines how traditional CRM technologies, while valuable in helping organizations manage customers and revenues, have not really assisted the salesforce do their jobs.